Here on this page, I write mostly about my own expat experience and that of people like me. But of course, there’s another side to immigration in Spain and other countries in the south of Europe. Photo by José Palazon, originally published in eldiario.es. Ideally, the laws of the European Union protect asylum seekers, but in reality, not everyone has the opportunity to make their case for asylum. 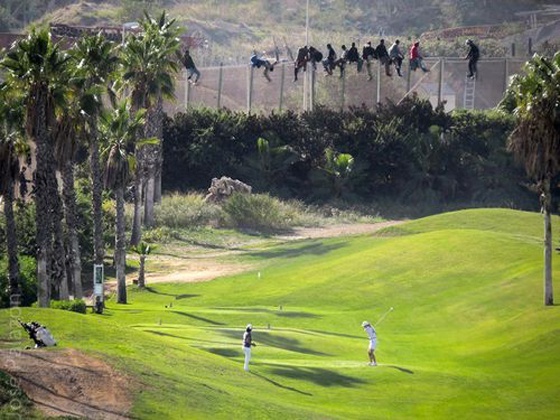 Recently there have been accusations of “devoluciones en caliente” meaning that the Guardia Civil simply catches people at the border and dumps them back on Moroccan territory. If you want to know more, you can check out a new documentary by director David Fedele, called The Land Between.It will be screened at Teatro del Barrio in Lavapiés on Tuesday, 16 December. More info here: Presentation of The Land Between. Even after you arrive, immigrant life isn’t always pretty. Foreigners end up in contact with many aspects of life that native-born Europeans have no idea about. And of course, the Spanish are emigrating en masse to other countries where the prospects are better. Perhaps they’ll come back with a greater understanding of what it’s like on the other side of the fence. P.S. Christmas is coming. And on a semi-related note, that means local politicians in blackface. Oh well, I’m looking forward to being off work and to getting out of Spain for awhile. Belgium, here I come!